“Designed as a brand immersion footprint with inventory, merchandising and layout at an aesthetic to create a fully transactional space.” Matt Walsh, AIA, ID+A Inc. 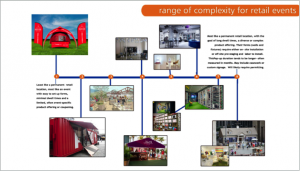 Develop a method to enable brands and agencies to launch short-term, opportunity-based retail locations that are not RMU’s. To read the full presentation, download the pdf here.